The Recruitment and Training Subcommittee (RATS) was set up in February 2014 to give greater focus to recruitment and training of ringers within the Ely Diocese. The Recruitment and Training Subcommittee has responsibility for the Stretham REC and the Ely DA Young Ringers. The RATS decides on expenditure from the Ely DA’s Recruitment and Training Fund (RATF), which is used for financing recruitment, training and promotional activities in the Ely DA area. The RATS terms of reference are defined in the Regulation 4a of the Ely DA here. There is a separate email address for the subcommittee: rats_at_elyda.org.uk. The Recruitment and Training Subcommittee aims to include a broad representation of the whole Association in its members. Anyone interested in joining the subcommittee should contact them via rats_at_elyda.org.uk. New Ringer's Packs are now available from the Ely DA. These can be ordered for any new ringer, whether or not they are an Ely DA member. Anyone can order one - tower captains, trainers or simply friends of the new ringer. 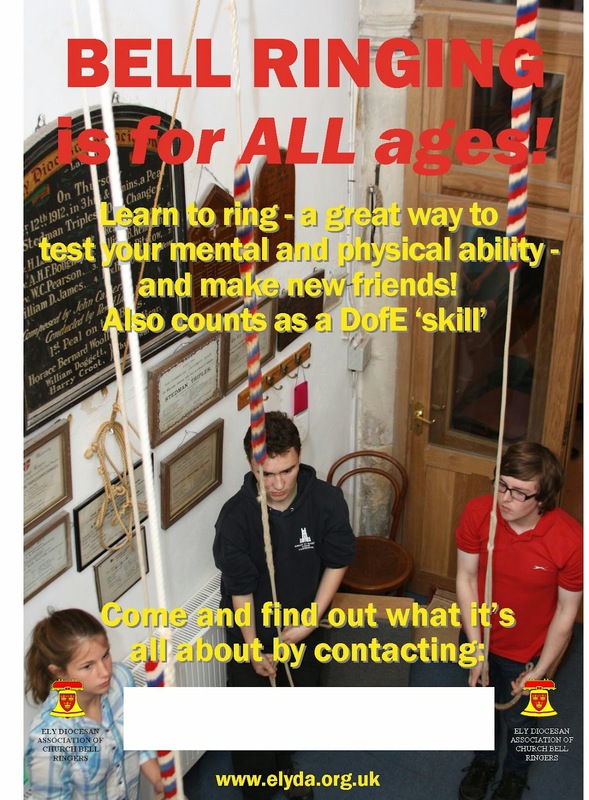 The packs, which are free, contain informative booklets and leaflets about bell ringing and about the Ely DA. Please email rats_at_elyda.org.uk to order a New Ringer's Pack. November 2015 - This questionnaire is now closed, and the results are being studied. Every year we lose many ringers. How many people do you know who have given up ringing? If you are a ringing teacher, how many of the people you have taught still ring? Nationwide, we lose about half of all ringers every 10 years. We need to recruit more ringers, but vitally we also need to retain more of those whom we recruit. How can we make the experience of learning to ring more rewarding? How can we train more teachers of bell ringing, and pass on recent developments in teaching techniques? Currently 79% of teachers are aged over 50. Only 12% of ringers are aged between 20 and 40. We ringers are an ageing species. How can we recruit more young ringers, and how can we provide them with role models by training younger people to teach? What is the EDA doing? The EDA’s Recruitment and Training Subcommittee (RATS) was set up to support and co-ordinate the good work that towers and Districts are already doing to answer these questions. We can arrange support for your recruitment initiatives. 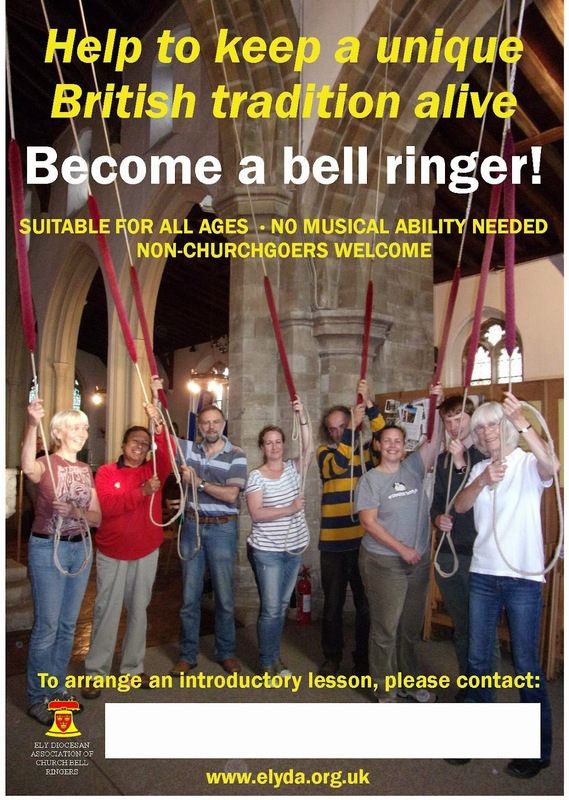 To help with your training needs, we have set up a Ringing Centre at Stretham (opening early 2015), which will be available for all ringers to use. To increase the number of confident teachers, we will host ITTS training courses and aim to help trainee teachers achieve their certificates. ITTS – the Integrated Teacher Training Scheme - is run by the Association of Ringing Teachers (ART). ART also runs the ‘Learning the Ropes’ scheme which provides a structured syllabus for learners. ART’s mission is to improve the learning experience of new ringers through improving standards in the teaching, and thereby to sustain the art of change ringing. This questionnaire asks you how we can help you. But making a success of these initiatives relies on all the ringers in the EDA area helping each other, so the questionnaire also asks how you can contribute to the solution. With around 900 ringable bells across the Ely Diocese but only 700 Association members – many over retirement age – to ring them, it’s clear we need to attract more new ringers as a matter of urgency. That’s why recruitment and training is now a top priority for the Association. The Association’s Recruitment & Training Sub-committee – R.A.T.S. for short – is kicking off its 2015 ringer recruitment drive by making sure that every active tower receives a supply of posters to mount their own local publicity campaigns to create interest and generate enquiries from prospective new ringers who want to learn. There are two posters, one aimed at adults of all ages and one designed to target under-18s. We are sending two copied of each poster to all active towers in the Association. The posters are completely weatherproof so you can display them outdoors without additional protection. On both designs there is a white panel to write in the relevant contact details for enquiries using a waterproof felt tip pen. Please would you help us, and yourselves, by arranging to display the posters for as long as possible in places locally where the maximum numbers of people will see them, such as community centres, your church noticeboard, local shops, pubs, health centres, schools and youth clubs. If you need more waterproof posters, you can request them from Peter Binns at pro@elyda.org.uk. You can also download them to print yourself here and here. If you would like more help with recruitment, or with teaching the learners you recruit, please do contact your District Education Officer (see the relevant District website) or the R.A.T.S. at rats@elyda.org.uk. In the meantime, thank you for your co-operation and good luck with your recruiting!